Every few months, a hot, new social media tool hits the scene — Pinterest, Periscope, Foursquare, Blab — and some marketing experts make it sound like if you’re not using that new platform, you’re missing out. That notion gives me a massive headache. Like everyone else, I feel pressured to have a presence on every social media platform, but I can’t possibly contribute to every one — at least not without doing a lousy job on all of them. Wouldn’t it be great if we could simply focus our social media marketing efforts on one or two platforms we know our prospects use to share content and connect with one another? But how do you know which social media sites to choose? If you take a wild guess at your audience’s favorite social media platforms, you may guess incorrectly, resulting in wasted time and missed opportunities. To avoid mistakes, conduct smart research, figure out which social media sites your audience prefers, and then spend the majority of your social media marketing efforts on those sites. But that process isn’t as straightforward as you might think. I asked the smartest people I know in the marketing world where they would go to find this information, and I got a lot of different answers. It turns out, there’s no “magic website” you can use to do this research. Let’s go through this slightly messy process, step by step, so you feel comfortable doing it for your own audience. 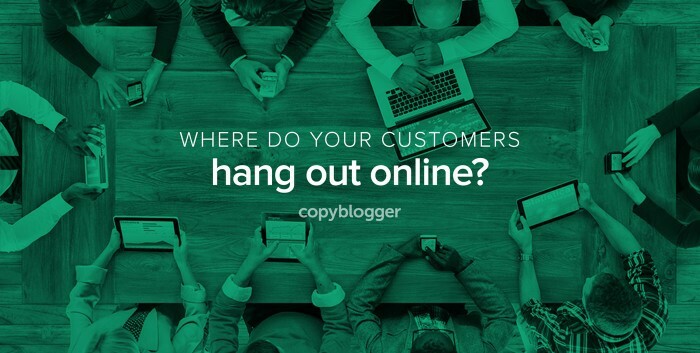 The best way to find out where your target audience hangs out online is (surprise!) to ask them. The first thing you should do is arrange informal interviews with your favorite clients or customers. To do this, simply write a short list of questions and reach out to five to ten people from your existing social media following or email list. It’s best to target people you think of as your favorite or ideal clients and customers — active members of your community who you trust to give honest feedback. Once you’ve got your list, email or call each person and ask if you can chat with them on the phone for 20 minutes and ask them some questions. During your interviews, ask them about their favorite social platforms, where they typically share content online, and where they typically connect with their friends, family, colleagues, and community members. Take notes on your conversations — or better yet, record the interviews (with permission, of course). Your most reliable information will likely come from client and customer interviews, but unfortunately, interviews don’t scale well. To collect more data, set up a brief, to-the-point survey and distribute it to your audience. If you first conduct a handful of interviews, you can use the information you gather to craft the survey questions. You can also include other relevant questions that will help you understand their social media behaviors. Next up, we’re going to do a little competitive research. Your job in this step is to brainstorm and put together a list of about five to ten websites that serve the audience you’re trying to reach. Create an Excel spreadsheet or Google doc to track this information, so you can keep everything organized and in one place. Think of competitors’ sites or referral partners, and then perform a quick online search to find additional sites. For example, enter “[YOUR TOPIC] + blog” or “[YOUR TOPIC] + podcast” into Google and hit enter. Review the search results to see if your target audience would spend time on those sites. You can also search on AllTop to find similar sites. BuzzSumo can be used for competitive research, as well. 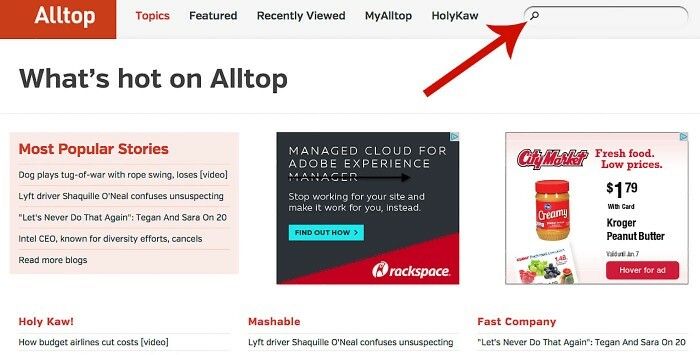 Enter any topic in the front page search bar, click the “Search!” button, and you’ll see a list of the most-shared posts on that topic, from a variety of websites. As you discover new sites, add them to your spreadsheet. You can go back to BuzzSumo and perform a slightly different type of search to find this information. On the BuzzSumo home page, look for a blank search field. This time, enter the domain name of the first site on your research list, and click the “Search!” button. 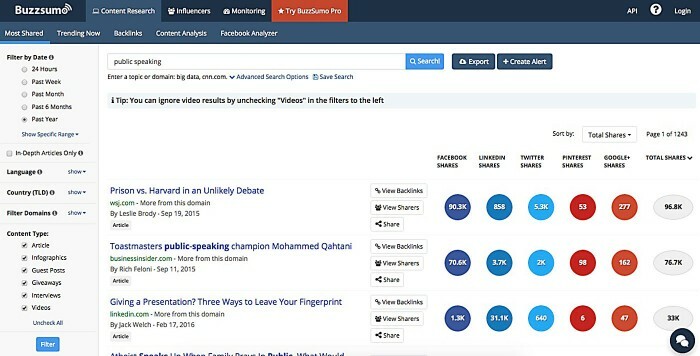 BuzzSumo gives us the top five most-popular posts for that website (from the past year) and then displays social data for that post from Facebook, LinkedIn, Twitter, Pinterest, and Google+. Once you’ve noted the most popular sharing platform for this site, repeat the process for all five to ten blogs on your list. Trends should emerge, and you’ll likely be able to discover readers’ top two favorite social sites. If you’re looking for even more data, you can also try SimilarWeb. At this point, hopefully you’ve narrowed down your potential options to one or two social media sites. Now it’s time to make sure they’re a good match for your business, marketing goals, and customers’ worldviews. This part of your research is more subjective — it’s essentially a “gut check” test. The typical demographics of the social site. Many social sites publish demographic information about their users, so you can see a breakdown of the ages and genders of the users. The features of the social networking platform. For instance, Instagram and Pinterest are highly visual, so any company that decides to market using these two tools should be prepared to create appealing visual content. Your marketing goals. Will this platform help you accomplish your content marketing goals? A food blogger decides to focus her social media efforts on Pinterest, because she’s targeting moms who make healthy lunches for their kids. Food is a popular topic on Pinterest, so she can be reasonably certain Pinterest would be a good platform for her to use to reach her target audience. A B2B company that sells software as a service (SaaS) has performed research and knows their target audience shares content and connects with colleagues and prospects on LinkedIn, so they decide to try out the platform and see how it performs for them. A tattoo artist creates a presence on Instagram because the primarily image-based platform is an ideal place to showcase his portfolio. The statements above are generalizations, and — as always — your mileage may vary. The most important thing is that you know who you’re trying to reach and perform your own research on the best ways to connect with them. When you decide to build a presence on a social networking site, run tests to make sure you’re on the right track. For example, if you want to give Pinterest a shot, because your research is telling you that’s where your audience hangs out, then throw yourself wholeheartedly into developing a Pinterest following. Give it six to eight months, then review your data to see if you’re getting the results you want (in terms of traffic, subscribers, and conversions). If a platform isn’t working out for you, don’t be afraid to move it lower on your marketing priority list or drop it completely — no matter what your pre-research says. You may want to repeat the steps above every six to twelve months, to stay on top of changing trends and remain in touch with your target audience’s behaviors from year to year. The best way to make social media work for you as a content marketer is to find out where your perfect prospects are and spend time there. Don’t go to the places where they’re not hanging out. When you conduct your research thoughtfully and make your decisions based on that research, you’ll get far better results. How do you decide which social media sites to spend time on? Share in the comments below.